- Have not taken any core science and math classes for the last 12 months? If so, a review test-prep book is not going to cut it for you. You need to re-learn (not review) the subjects to ensure the maximum score on the exams. But how? We have the solution - re-learn these subjects via our break-through Rapid Learning courses, one subject at a time, 24 hours per subject. We have EVERY required subject in life science, physical science, and math by the Nursing School Entrance Exams (such as TEAS, NET, RNEE, HESI A, NLN PAX-RN, PSB-RN, etc.). These courses are required if you are going for an associate degree, diploma or bachelor's degree in nursing. Rapid Learning offers 6 courses to cover each of the three areas: Life science, physical science and numerical abilities with one-to-one match. 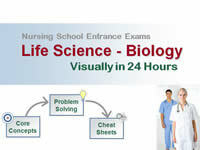 College-Prep HS Biology - Rapid Learning 24-Hour Series, is a fast-track rich-media course to visually study (not just review) the biology topics needed for nursing school prerequisites for any associate & bachelor's degrees in nursing. Comprehensive coverage of the traditional one-year curriculum at high school for college-prep students. Mirrored to all major biology textbooks. Developed and narrated by college professors and HS educators. Learn biology at molecular, cellular and system levels. Rich-media visual learning for rapid exam preparation. Online Access & DVD Package Shipped. Comprehensive Anatomy and Physiology - Rapid Learning 24-Hour Series, is a Rapid Learning course to visually study (not just review) the often-tested anatomy and physiology topics needed for nursing school prerequisites - a must-study subject for the exams. System-level structures and functions of human body. Topics comparable to mainstream textbooks. Developed and narrated by subject experts. Hour-by-hour, one-chapter-per-hour study in 24 hours. Rich-media visualization for rapid mastery. Ideal for rapid nursing exam preparation. College-Prep HS Chemistry - Rapid Learning 24-Hour Series, is a fast-track rich-media course to visually study (not just review) the chemistry topics needed for nursing school prerequisites for any associate & bachelor's degrees in nursing - a must-have course for nursing. Mirrored to all major chemistry textbooks. All key concepts & problem solving in chemistry. Basic math is required for numerical ability and problem solving in chemistry. 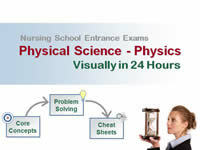 Colleg-Prep HS Physics - Rapid Learning 24-Hour Series, is a rapid learning course to visually study (not just review) physics topics needed for nursing school prerequisite - Learning made easy, even with a difficult subject like physics, with smart teaching and rich media. Complete study of physics including mechanics, electricity, magnetism, waves, sound and modern physics, comparable to one-year curriculum. Rich-media visualization for easy and rapid mastery of physics. Basic Math - Elementary Algebra - Rapid Learning 24-Hour Series, is a fast-track rich-media course to visually study (not just review) the basic math needed for nursing school prerequisites for any associate & bachelor's degrees in nursing. In-depth coverage of basic algebra, pre-algebra review, word problems etc. Learn basic math the visual way at rapid pace. Rich media visual learning for rapid exam preparation. Geometry - Rapid Learning 24-Hour Series, is a Rapid Learning course to visually study (not just review) the geometry topics needed for nursing school prerequisites via rich-media, the visual learning for this visual geometrical subject..
Topic-by-topic for the entire geometry curriculum in a 24-chapter course. Why Rapid Learning's Nursing Extrance Exam Courses? Looking for rapid yet comprehensive in-depth study of Nursing Entrance Exam subjects? Solution: These are full 24-chapter courses designed for nursing college-prep deep study, by our signature Rapid Learning system, not just an outline or quick review. If you have been away from those core science and math courses for more than 12 months, a high-level review or high-impact overview will not cut it. You need to RE-LEARN the subjects rapidly and visually - that is what Rapid Learning empowers you to achieve. Tired of lengthy test-prep texts and talking-head lectures with no depth? Solution: Forget static test-prep books. The best way to prepare these exams is to deep-study all required courses comprehensively topic by topic via a fast-track system such as Rapid Learning. No more monologue teaching. Learn it the rich-media way with enhanced visualization and graphics for both visual and auditory learners. Is this another flash-card system or audio-only course? Answer: No, for deep study of science and math, just flash cards or audio alone will not do the job. Go rich-media! These are visual tutorials developed and narrated by science and math professors, powered by the same technology as YouTube. Furthermore, instead of flash cards, we provide at-a-glance cheat sheets, one per chapter, with 24 cheatsheets for 24 chapters in a course. We also provide a master cheatsheet for the entire course for test-prep super review and memorization keys. As to the audio, we use MP3 only for supplemental learning to visual learning, each MP3 also comes with printable mini-book. How Can I Learn It in 24 Hours? There are a total of 24 lessons (topics) in each course, one lesson per hour with 30-minute on concept tutorial, 20-minute on problem drill and 10-minute on cheat sheet. This will make up the 24 hours rapid learning on a given subject. 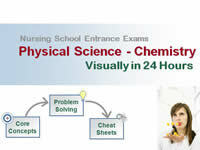 The Rapid Learning Science and Math Combo Series – The Easy and Rapid Way to Ace Your Nursing School Entrance Exams! Note: We can also offer a custom combo at a similar discount with courses based on your academic requirements, as we have all the core science and math courses for pre-nursing programs and nursing entrance exams of any kind. Call for more details.